The United States launched its newest weather-watching satellite early today to ensure forecasters have accurate information during this summer's predicted active hurricane season. A $90 million Lockheed Martin Atlas 2A rocket successfully carried the satellite into space from Cape Canaveral Air Force Station in Florida. The middle-of-the-night launch occurred 40 minutes late so technicians could replace a faulty valve at pad 36A and to allow another object in space to pass clear of the rocket's planned trek. At 3:07 a.m. EDT (0707 GMT), the Atlas' three liquid-fueled engines rumbled to life and the rocket was released for the 27-minute journey. As the rocket passed high above the Central Atlantic Ocean just west of the African coastline, the Centaur upper stage released the Geostationary Operational Environmental Satellite-L, or GOES-L, spacecraft. No problems were reported during the launch that marked the 49th straight success for the Atlas rocket family dating back to 1993. 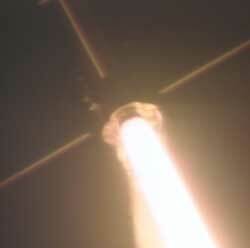 "The spacecraft appears to be exactly where we wanted it to go," said NASA Launch Director Chuck Dovale. "It was a perfect flight." Within a half-hour, ground stations established communications with the Space Systems/Loral-built satellite, confirming its health after the arrival in orbit. A series of engine firings by GOES-L over the next 17 days will boost the craft from its current highly elliptical geosynchronous transfer orbit to a circular geostationary altitude 22,300 miles high. Controllers will park the satellite over the equator so testing can begin to prepare the $250 million spacecraft for its mission of tracking weather conditions over North America. GOES-L, to be renamed GOES-11 once it reaches the operational orbit, becomes a critical backup satellite that will ultimately replace one of the two GOES spacecraft currently operating. The GOES system -- operated by the National Oceanic and Atmospheric Administration -- relies on two satellites to cover the Western U.S. and Pacific Ocean and the Eastern U.S. and Atlantic Ocean. The satellite now stationed on the eastern front -- GOES-8 -- was launched six years ago and has worked one year beyond its design life. Its advanced age concerns officials that the craft might soon malfunction, halting the stream of weather information for the Eastern U.S. and Atlantic region. Even more worrisome is the approaching Atlantic hurricane season that begins June 1. Without a functioning eastern satellite, the nation's hurricane experts would have great difficulty predicting where the deadly storms might go. "It's vitally important that we have continuity of data or we may be finding ourselves impaired in our capability of forecasting," said William Proenza, director of the National Weather Service's southern region. Every American that watches weather reports on television sees the product of the GOES system. 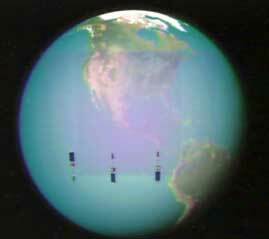 The imagery and data used by forecasters comes from the orbiting GOES spacecraft. "Real-time weather data gathered by the GOES satellites, combined with Doppler radars and the surface-observation systems we have are all a very, very critical input to forecasting," Proenza said. "The vital ingredient of the benefits of the GOES satellites is to provide data to us over the ocean where data is relatively scarce." Besides being a crucial tool in hurricane tracking, the GOES system is used in other severe weather forecasting including tornadoes and flash floods. GOES-L, running a year late by rocket and scheduling delays, is the fourth in the current series of five advanced weather satellites. The next spacecraft -- GOES-M -- is scheduled for launch in July 2001. 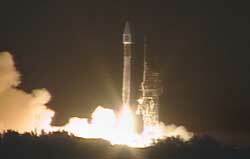 Launch site: SLC-36A, Cape Canaveral Air Force Station, Fla. The Lockheed Martin Atlas 2A rocket lifts off from Cape Canaveral carrying GOES-L into orbit. Watch a movie about the planned sequence of events as the Atlas 2A rocket carries the GOES-L weather satellite into orbit. NASA animation shows the GOES weather satellite in geostationary orbit around the Earth. Launch preview - Read our story for a complete preview of the GOES-L launch. Atlas 2A vehicle data - Overview of the rocket that will launch GOES-L into space. GOES-L - Description of the satellite to be launched on AC-137. Launch windows - Available windows for future launch dates of AC-137. GOES operations - NOAA's Office of Satellite Operations for GOES. GOES Satellite Server - NOAA Web site with continuous GOES imagery. GOES at NASA - GOES project management Web site at NASA-Goddard Space Flight Center. GOES science - NASA's scientific research using GOES satellites.